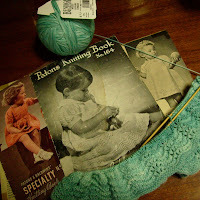 A couple of posts ago I was talking about some yarn I had hand dyed to a soft aqua ... well I've started knitting it up. A dress for granddaughter - it'll be a combination of 3 very old Vintage Patterns - “Joy” in Patons Knitting Book No.164, “Barbara” in Patons Knitting Book No. 175 and “Nancy” in Patons & Baldwins’ Specialty Knitting Book No. 116. No copyright dates - 116 might be 1930s - the others early 50s ? not sure. The plan is to mix the bands of wave stitch and puff sleeves from “Joy” with the maths and sizing from “Barbara” which is for 4ply (as is my yarn) and the bodice styling from “Nancy” - not sure if I’ll make a collar or not. The slight variegation in the yarn is knitting up quite pretty and it seems appropriate to knit wave stitch in an aqua colour.